Using four organic plant proteins, Epic Protein chose this source for their balanced and complete protein content, natural bioavailability and rich nutritional synergies. Boasting a complete amino acid profile and free of nuts, soy, gluten, and GMO’s, this powder tastes real because it is! Farm sourced, optimally dried, thoughtfully formulated and all for your enjoyment, Epic Protein is an amazing addition to our ingredients profile. Contains up to 26 grams of organic plant protein, complete amino acid profile, builds lean muscle, highly digestible, boosts energy and endurance. The “alkaline” in alkaline water refers to its pH level. On the pH scale, the higher the number, the more alkaline the substance. Because of the higher pH, it is believed that alkaline water can neutralize acid in your body (Healthline 2015). A relatively new health trend, alkaline water is mineralized to get to the alkaline state. The World Health Organization warns against drinking too much distilled or reverse-osmosis water (the opposite of alkaline). Neutralizing acidity in the body. All the benefits of water! Derived from red algae or seaweed, and originating in the East, agar powder have many uses! In cooking, agar powder act as a plant-based thickening agent and can be substituted for eggs in recipes as well. There are many health benefits, but namely agar is known to absorb glucose and bile which may help lower the amount of cholesterol absorbed by the body. Used to promote weight loss and can lower blood cholesterol and glucose levels. Agar can be purchased in flakes, powder, granules, and blocks! Are you lifting, hiking, biking, surfing, swimming, yoga-ing today? Looking for that extra protein boost? Don’t worry, we’ve got you covered! We carry regular, chocolate, and vanilla Warrior Food protein powder. It’s deliciously healthy, organic, gluten-free, all-natural, non-toxic, raw, vegan/plant-based protein powder that’s claimed to be better assimilated in the body than most of the other protein powders out there (which means you need less to get the same benefits as other proteins). Made from organic sprouted, non-GMO brown rice and organic hemp seeds, Warrior Food’s protein powder is gentle on the stomach, easy to digest, and optimal for kidney health and blood sugar regulation. So, why not add a scoop to your next Fruitive Liquid Meal or SuperBerry Bowl? may help improve blood pressure levels, aids in weight loss and blood sugar regulation, increases energy levels, promotes muscle recovery, immune boosting, helps rejuvenate hair and skin, anti-inflammatory benefits, may help replace lost electrolytes and fluids. Complete amino acid profile. Protease, alpha-galactosidase, amylase, cellulase, lipase, bromelain, & papain. may help improve blood pressure levels, aids in weight loss and blood sugar regulation, increases energy levels, promotes muscle recovery, immune boosting, helps rejuvenate hair and skin, anti-inflammatory benefits, may help replace lost electrolytes and fluids. (Plus, chocolate is a natural stimulant). Nutritional yeast is indeed just that, nutritional! It may not sound very appetizing, but this cheesy-flavored substance is an amazing source of vital B-vitamins (including vitamin B12), essential amino acids, zinc, and selenium. In other words, it’s a must for individuals on a plant-based or vegan diet – we all need those B-vites people! Additionally, contrary to it’s name, nutritional yeast is non-yeast forming in the body and gluten-free. So, don’t be afraid of the name, indulge in the cheesy, savory flavor and add it to your next batch of kale chips or “cheesy” garlic bread. Yum! 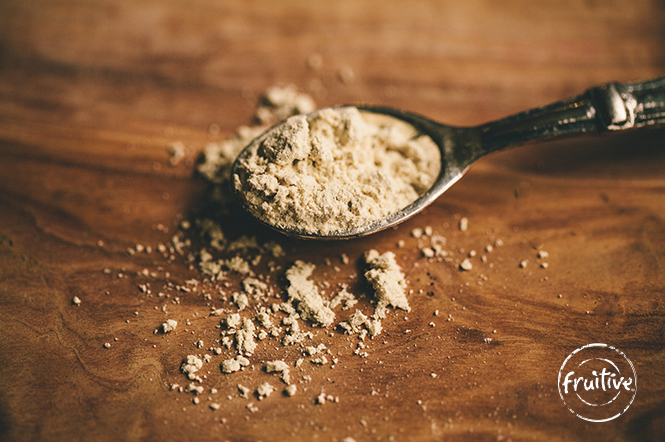 Nutritional yeast is basically bread-rising yeast that's been deactivated. Looking for an all-around nutritional powerhouse? Look no further! E3Live is a nutrient-dense, organic blue green algae that’s tough to beat. Packed with 65 vitamins, minerals, amino acids, and essential fatty acids, it’s truly a superfood in all the right ways! But, that’s not all, E3Live is also said to provide more chlorophyll than any other food source – helping oxygenate and purify the blood and organs, detoxify, and promote healthy digestion. E3Live is known to increase endurance and stamina, balance moods, reduce stress, regulate insulin levels, support intestinal health, and improve focus. Be alive, feel alive… E3Live! Chlorophyll, beta-carotene, vitamin A, carotenoids, B-complex vitamins, vitamin C, omega-3 fatty acids, phenylethylamine (PEA), enzymes, and 22 amino acids, including all 8 essential amino acids (protein). E3Live is said to contain more protein than any other food source, most likely due to its complete amino acid content – with all 22 amino acids, 8 of which are essential (amino acids are the building blocks of protein and muscle).